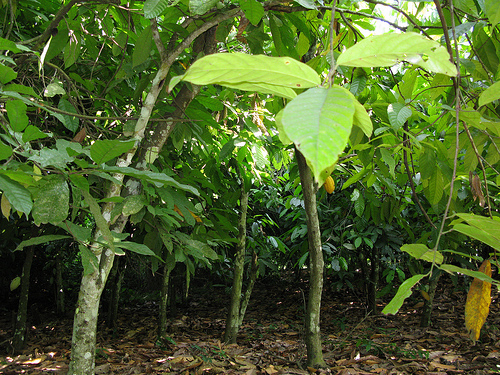 Development in Action | Ghana’s cocoa industry: why is it not taking off? the world. Ghana’s cocoa industry is particularly strong, contributing 23% of the world’s cocoa production in 2011-12; this is a 2% rise from last year and cocoa represents about 30 per cent of Ghana’s total export earnings. So despite being rich in mineral resources, and endowed with a good education system and efficient civil service, why is Ghana unable to develop a world leading chocolate industry? There are threefold main factors which prevent Ghana from manufacturing its own chocolate on an international scale. Ghana exports its valuable natural resources at a far lower price and therefore it is not able to realise its comparative advantage. Consequently, countries such as the UK are making use of the cheap cocoa and labour, with companies such as Divine which use Ghanaian cocoa. Secondly, Ghana’s infrastructure remains under-developed, which is damaging to an otherwise promising export market. It has just 11 airports catering for a population of 24 million and has less than half the road connectivity and rail penetration in comparison with the world average. Poor infrastructure means that export and manufacturing costs are far higher than they should be, which means integrating into a global market for a product such as chocolate that requires transport and manufacturing is virtually impossible. Ghana therefore has to stick to exporting Cocoa. Transnational corporations are a product of globalisation; they lead to investment in the local economy and the creation of jobs. But they also have serious drawbacks. Of the licensed buying coca companies in Ghana, the Produce Buying Company has the largest market share with a five-year average of around 40%. The second largest license buying company (LBC) is the domestically owned Akaufo Adamfo which has an average market share of 15%. The top four companies by market share own 90% of the market, resulting in a monopolising effect – new start ups are unable to compete with the bulk power of the larger companies, unable to drive down their costs so effectively. Farmers trust selling their product to those companies which they have worked with in the past, and are therefore less keen to work with the unknown new Ghanaian business. The LBCs can also own the primary product, which means that large amounts of the sector are unavailable to the starting business. All these factors have led to a dwindling number of new businesses starting up. Consequently, TNCs such as Cadburys have become even more dominant in the Ghanaian market. For this reason, it is doubtful that Ghana will ever truly be able to entirely manufacture their own chocolate. There is another reason for Ghana’s slow development. The lack of economic competition has been a troubling problem. This not only discourages investment but also damages internal industries, such as the chocolate industry. This idea as to why many countries experience a lack of growth was spearheaded by Paul Krugman and Tony Venables in some of their works, and by Paul Collier in his book The Bottom Billion. A lack of competition between companies means prices are likely to stay high and efficiency is unlikely to increase – you only need to look at the four Ghanaian cocoa companies having a 90% market share. Collier argues that in order to break into global markets for manufacturers it is necessary to get over a threshold of cost-competitiveness. This expansion can in turn create jobs and economic security, and eventually the labour market tightens, wages start to rise, and the economy expands. Unfortunately for Ghana, these economic agglomerations have failed to move to the rest of Africa, and thus Ghana’s chocolate industry has been caught up in the slow lane.